Fine Feathered Friends or Foes? 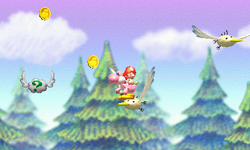 is the second level of World 5 found in Yoshi's New Island. Yoshi starts the level in a snowy area with various types of Goonies nearby, along with a pipe. It leads to the Checkpoint Ring and an area where Yoshi must ride on Goonies to get to higher ledges and another Checkpoint Ring. Eventually, Yoshi reaches some more Bowling Goonies and the Goal Ring. Ahōdori wa Tomodachi? Are Goonies Friends?